Move over Mike Bassett! How would the 2018 World Cup managers rate on celluloid? 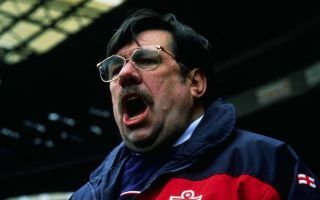 Despite plenty of demand and much teasing about a sequel, England’s most popular fictional football manager, Mike Bassett, did not return to the big screen ahead of the World Cup. ‘Mike Bassett: Interim Manager’ never made it past the pre-production phase, but there are plenty of real-life characters prowling the touchlines of Russia this summer who could potentially have what it takes to be the subject of movies. After the 7-1 hammering by Germany in 2014 that brought floods of tears from fans and a national on-field apology by David Luiz, Tite was brought in to add some much-needed steel to the fallen swagger. He ensured that Brazil became the first team to qualify for the 2018 finals. “Creativity without organisation is a mess” he boomed and if you look into his eyes, he really is as effective as Kenny Craig from Little Britain. One critic called him a “snake-charmer”. Tite must hope his front three of Neymar, Coutinho and Jesus don’t get strangled by a German Monty Python again. Young, thrusting and unbeaten as national coach, Julen Lopetegui’s selection as the new Real Madrid manager certainly raised a few eyebrows. Absolutely nobody was expecting it and nobody was excited about it….Until it led to his sacking as Spanish coach. Fernando Hierro has stepped into the breach with the boldness of a bloody revolution. The cold-blooded killer Spanish football federation (RFEF) president Luis Rubiales looks like he could break a few bones as well as contracts. Dario Gomez has promised that if Panama win a game in Russia, his team will party as hard as they did when beating Costa Rica in the 88th minute to qualify. A fiery character with a love of (29ABV) fiery water, Gomez had to resign as Colombian manager in 2011 after striking a woman outside a bar in Bogota. El Bolillo or the Truncheon is not the kind of man who will sit on the fence and watch the world go by. Police officers had to restrain him from an altercation with Honduras boss Jorge Luis Pinto at a Copa Centroamericana tie last year. Put your flak jacket on, Gareth. During Euro ’16, the host nation’s coach left out Karim Benzema under a wave of controversy and generally seemed smaller than he actually is with the pressure of an expectant country. There is something of the muted Avram Grant about the former Marseilles manager. It doesn’t make great cinema. However, he stirred his players into a thrilling second-half comeback against the Republic of Ireland in the last 16, claiming: “I can raise my voice if I have to.” Steady on, Didier. The feeling remains he may be too conservative with a charisma bypass for a squad that screams France Has Got Talent. The Portugal manager wears the look of a man who’s just been told that he is responsible for keeping Ronaldo happy for a whole month. Or that he caused the Greek Euro crisis. Forget the G7 Summit, Santos can claim the Presidency of international football as he led Greece to Euro 2004 victory over the tearful CR7 before joining his compatriot in glory two years ago. Santos is quite happy for Portugal to be the “ugly duckling” as long as they get the win. He truly is the Godfather to CR7. When he was appointed in 2016 , Barney Ronay wrote in the Guardian that : “Southgate presents an earnest, bookish figure carrying out his public duties with the air of an ambitious young geography teacher hurrying into class three hours early to set up his papier mache sedimentary rock bed.” This is no rock star manager. He is more like Clark Kent without the Superman costume underneath, looking for truth and integrity in the midst of a corrupt world. FIFA, Gareth is coming for you. Japan’s World Cup preparations were put into disarray as they took “an emergency measure” by dumping former Bosnian War soldier Vahid Halilhodzic as manager just two months ago after losing to Ukraine and scraping a draw with the mighty Mali. Nishino, a former national player, rode in to tend to his “wounded” troops. Come to think of it, he does look a bit like a Japanese Tom Cruise. In the cult film, Marathon Man, Dustin Hoffman gets the benefit of some dental work by the evil Laurence Olivier. It is painful to watch, almost as tortuous as seeing England get knocked out by a team trained by a part time dentist in Euro 2016. Hallgrimsson has proved that he can take on the best of Europe, so now his next trick will be to drill holes into Lionel Mess and company. Don’t put it past him. He preys on tight team spirit and the decay of more talented teams.